The first show I went to that meant anything could’ve ended with a swift trip to the hospital. It was 2000, I was 14, it was a Less Than Jake show, and some friends and I were caught off-guard by the whirlpool of flailing limbs that erupted in the middle of GA at The Worcester Palladium. The floor of the Palladium was sticky and the crush of bodies that started to lean in one cohesive, circular motion eventually knocked me to the ground. I remember looking up, terrified to my bewildered core, and internally screaming, “IF THEY CAN SEE MY FACE THEY CAN’T KICK IT! THEY CAN’T!” I watched my friend Dan throw his arms out over my clumsy, half-crouching body to keep a flurry of kicking, punching kids from hurtling in our direction. I’m pretty sure our facial expressions matched. Dan pulled me up off the floor, we shoved our way to the back of the pit and we eventually found Libby and Allison, the friends with whom we’d come. I think my breathing regulated by the time the third song started. I distinctly remember panicking because I had left my inhaler in my backpack, which was in the backseat of Dan’s mom’s station wagon that had long since dropped us off. By “Magnetic North,” we’d found a spot by the booths beyond GA up against the railing. By “Great American Sharpshooter,” the pit was forgotten and my wheezing had been replaced with breathless bursts of out-of-tune lyrics and my cheeks hurt from grinning too hard. By “History of a Boring Town,” the ska-punk anthem that I listened to every single day on my Discman on the bus to school, that song that I pictured as the one that would roll in the opening credits should they ever make a movie about my barely broken-in life, I was in trouble. We bought t-shirts before the end of the night, royal blue ones that had “LESS THAN JAKE” written in the fiery script of the Hot Wheels logo across the chest, and we waited by the stage door. Singer-guitarist Chris Demakes and singer-bassist Roger Manganelli came out to greet the small group that had gathered there. They both signed our t-shirts, and Roger signed a yellow pick I pried from the unforgiving floor with my fingernails after the lights went up. For me, that was it. I had a favorite band, one I could sing along to every song with, and I had survived a real live mosh pit while figuring this all out. The Less Than Jake love affair didn’t wane through high school. Libby, who had introduced me to the band, went to shows like that all the time; half the guys we were accidentally elbowed by were friends with her and Allison. I had no idea how she got her parents to say yes to that, to going to shows a half an hour away from home when we were too young to drive, and I was jealous — so I made it my mission to listen to everything I could get my hands on that came from that universe contained within the Palladium’s ramshackle walls. I started to pay attention to the bands she’d mention on the bus and the t-shirts she’d wear, keeping an eye out at rushed trips to Newbury Comics with my confused parents and picking up scattered CDs if they were less than $10. Some of them I liked, some of them I didn’t; most of them I couldn’t find until I sheepishly started searching for them on Napster and Kazaa. (Or was it KaZaA? Whatever, the point is that’s where I found the Chainsaw Kittens after I’d eventually spotted them on Mark’s t-shirt in “Empire Records.”) New Found Glory, Spring Heeled Jack USA, Reel Big Fish, Goldfinger, The Unseen, Pennywise, The Pietasters: I started collecting records and sang Save Ferris songs into a hairbrush before school, smug and proud of the fact that the popular girls in my class were wearing eye glitter and practicing the choreography for “Baby One More Time” for a country club lip synch contest while I was actually listening to real music. I had favorite bands that nobody had heard of (besides Libby, who knew every awesome band alive). I had bands that I kept tabs on and concerts I wanted to go to. I had a thing, and that thing, beyond the piano lessons I took as a kid and the chorus I sang in at school, was music. My face had never felt hotter as it did the minute my parents vetoed Warped Tour that year, and every year that followed. (Back then, it was held at Suffolk Downs. My father, who spent the bulk of his 20s in a tiny apartment in Chelsea, said that Suffolk Downs “was not a place for good kids.”) The mixes I’d make for boys as I got older always had “Magnetic North” on them, along with New Found Glory’s “Eyesore” and Save Ferris’ “Let Me In.” As I got more into after-school theater, the CDs I’d keep in my mom’s car started to ease up on the snarly, saccharine ska-punk as Sondheim, Bernstein and Kander and Ebb made their way into my driving soundtrack rotation. Less Than Jake’s “Hello Rockview” — the album with “History of a Boring Town” on it — was the only constant in that mix, and it’s the only CD I replaced when house keys, mechanical pencils, and wayward sunglass arms would scratch its underside. When I got to college, my taste in music became shameful once again, as everyone in the dorm could see each other’s iTunes library on a shared network, and Less Than Jake wasn’t nearly as cool as The Books or Apples in Stereo or Belle and Sebastian. I phased “Hello Rockview” out of the playlist the girls down the hall could raise an eyebrow at and popped the CD in when I needed it. Eventually, I forgot where “Hello Rockview” was, and when I saw Less Than Jake downstairs at the Middle East on its 20th Anniversary tour in 2012, I went, I belted out every single word to “History of a Boring Town,” and I felt so stupidly sad and uncageably happy all at once. As the ’90s have been indisputably revived, with flannel and Nirvana reissues and all of the reunion tours you could possibly want making their way to a LiveNation venue near you, I should be less surprised about my first years of fandom resurfacing. Everclear, Filter, and Live are in their second year of touring together behind the hits that made them famous before Y2K; Blink182 reunited much to everyone’s surprise in 2009 and are closing out a show in LA to celebrate the 10th anniversary of “Untitled” as I type this. Unlike those guys, Less Than Jake never really went away or took a break in between records — they’ve played Warped Tour a zillion times, and hey, supposedly Bad Rabbits were their favorite roster bros in 2011! — and I wasn’t there to see that. I’d thought I’d outgrown the band, that its songs would no longer be relevant to me and that I was far too busy with far too many things to listen to as my iTunes queued up when I became a music journalist. That is so stupid. Denying your first moments of pure, deliberate, unadulterated bliss as a music fan is a shameful act in and of itself, one that seems wholly out of place when you’re standing in the back of a room with a mosh pit swirling steps away and the words to songs you’ve discarded hit you like an endless volley of sentimental sneak attacks — especially when you owe your life’s work to them, in its own weird, unquantifiable way. You don’t have to be the same person that met that band for the first time through memorizing the choruses they wrote; you don’t even have to have the t-shirt anymore. (I’ve lived in eight different places since I bought that shirt, and I still have it.) That doesn’t mean that the part of you that latched onto those elementary power chords and teenage sensibilities splintered when a song made its way into your life that soundtracked your opening credits a little better. 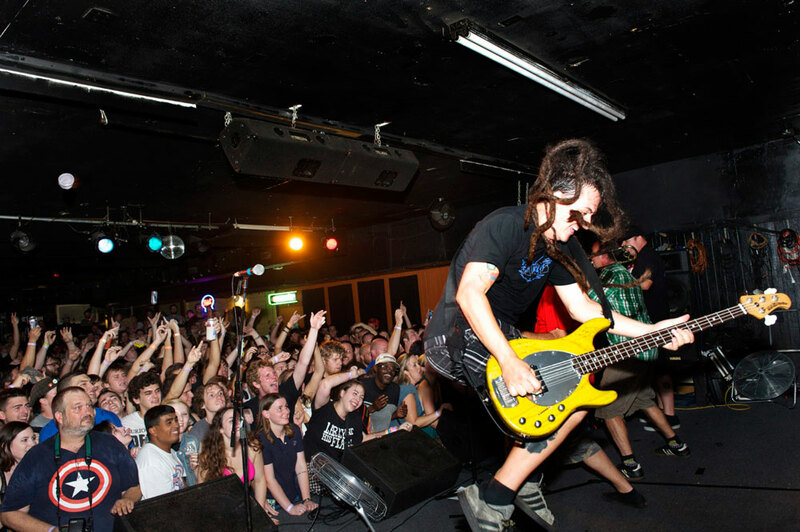 Less Than Jake is playing tonight at Royale. It’s an early show, which means kids will be home before their parents get pissed and grown-ups can get to work on time in the morning. You should go. I should, too.